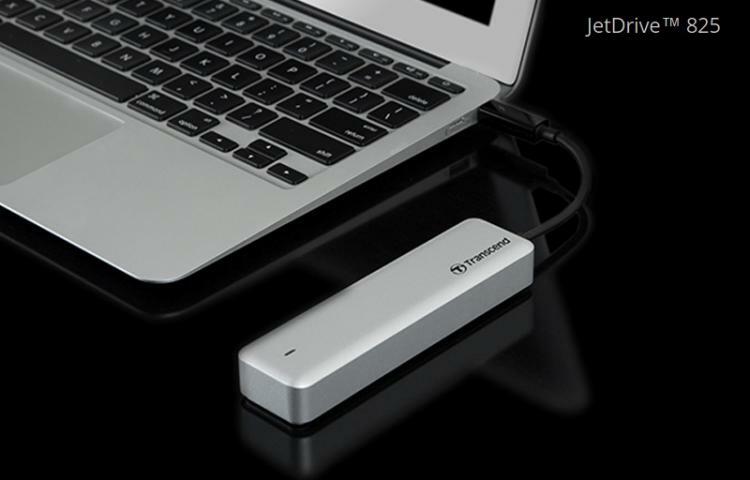 Transcend Information Inc. presents the JetDrive 825 Thunderbolt PCIe Portable solid-state drive for Mac computers. The new Transcend JetDrive 825 uses 3D NAND flash which offers improved performance, durability and capacity. The JetDrive 825 also features ultra-fast transfer speeds using the PCIe Gen3x2 interface through Thunderbolt 10Gb/s connectivity offering a speedy external data storage option for MacBooks and Mac PCs. The JetDrive 825 is also very compact having a size smaller than a typical smartphone. Transcend's JetDrive 825 features a 10Gb/s Thunderbolt interface, capable of blazing-fast file transfers. The JetDrive 820 features the PCIe Gen3 x2 interface capable of read/write speeds of up to 950 MB/s, bringing a whole new level of performance to Mac computers. The JetDrive 825 is constructed of 3D NAND flash, a technology that has allowed for storage size breakthroughs, and increased speed and reliability of data transfers. Say goodbye to bulky portable drives. The JetDrive 825 is designed to complement the simple and clean design of Mac having a sleek aluminium alloy enclosure. It comes with Transcend’s exclusive JetDrive Toolbox monitoring and firmware update application that’s designed specifically for Mac computers.